Members of the Economic Freedom Fighters party holds placards during their march for economic transformation outside the Johannesburg Stock Exchange in Johannesburg, Oct. 27, 2015. South Africa, which has seen widespread student demonstrations recently, has a long history of protesters demanding equality and social justice. The nation’s youth-oriented Economic Freedom Fighters party did just that last week. The left-wing party marched on central Johannesburg and on the city’s wealthy Sandton business district to demand more opportunities for black South Africans, who have been historically disadvantaged after years of inequality under the racist apartheid system. “We want to bring the best of the best policies, which will grow this economy and create jobs for everybody, and distribute the wealth of South Africa to all South Africans,” party leader Julius Malema said. The student protests, which started in mid-October over suggested tuition hikes, have similar aims, their demands centered around educational opportunities, equality and social justice. What made this movement so powerful, though, was their medium and who they reached. Using social media in a way few South African causes have, the students sent out more than 350,000 Tweets under the hashtag #FeesMustFall. In this nation where smartphones and Internet access are hardly universal, their message reached a group that has remained conspicuously quiet in South African politics: the middle class. Independent political analyst Ralph Mathekga said that’s what made these protests unique. Mathekga said each year, students at historically black universities take to the streets to protest tuition hikes, and they get little attention for it. 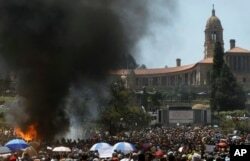 But the fact that this protest started at the historically wealthy University of the Witwatersrand and spread to the University of Cape Town and the University of Stellenbosch, and the fact that they used social media, brought it huge attention and took the movement off the streets and onto everyone’s screens. FILE - Students burn portable toilets during their protest against university tuition hikes outside the union building in Pretoria, South Africa, October 23, 2015. Mathekga said this could pose a challenge to the ruling African National Congress, which faces tough local elections next year. As South Africa’s black middle class has grown, their priorities, he said, have changed. “I want to provoke debate by saying, if I give people a certain amount of money, the middle class will want it to go toward education, but the poor communities would not want it to go directly there,” Mathekga said. “They might have more pressing things than university fees. The demands of the middle class are fundamentally different from that of the large majority of the poor, working class in the country. And the middle class has got more voice when it comes to framing their issues," he added. That, Mathekga said, is obvious by the outsized impact of the movement. He estimates the protests affected maybe 400,000 students, at most, a tiny fraction of South Africa’s 52 million people. If there is one South African politician who embodies these values, it’s Mmusi Maimane, leader of the official opposition the Democratic Alliance. The young, university-educated leader is, like Mathekga, an alumnus of the University of the Witwatersrand. Unlike President Jacob Zuma, who has no formal education, not even a high school matriculation certificate, and appeals to his base of poor rural voters by discussing more dire issues like social grants and housing for the poor, Maimane has drawn criticism for being out of touch with the reality of poverty in South Africa. He argued, however, that education should matter to all South Africans. “Access to quality education is surely the biggest leveler of the playing field when it comes to opening opportunities for young, disadvantaged South Africans,” Maimane wrote in a recent newspaper opinion piece. “All possible interventions to revive our economy and create jobs, if the ANC ever get round to this, will be in vain if we don’t produce a new generation of skilled, empowered South Africans to step into these jobs. Eradicating inequality and transforming society doesn’t begin with a job. It begins with a quality education,” he wrote. It’s a viewpoint that has, in recent weeks, gained traction, as seen by the swell of non-student supporters at student rallies and the support of unlikely allies like the anti-capitalist Economic Freedom Fighters. And it’s a sign, Mathekga said, that the political sands may be shifting.